Description: In the medieval kingdom of Goredd, women are expected to be ladies, men are their protectors, and dragons can be whomever they choose. Tess is none of these things. Tess is. . . different. She speaks out of turn, has wild ideas, and can't seem to keep out of trouble. Then Tess goes too far. What she's done is so disgraceful, she can't even allow herself to think of it. Unfortunately, the past cannot be ignored. So Tess's family decide the only path for her is a nunnery. 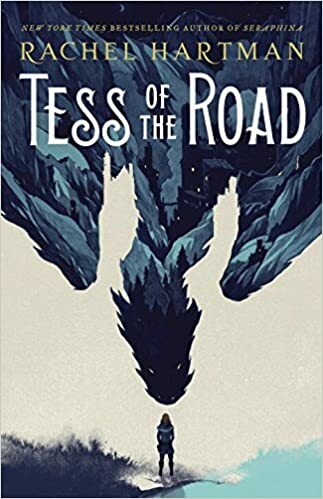 My Thoughts: TESS OF THE ROAD was an engaging coming of age story set in the same fantasy world as SERAPHINA and SHADOW SCALE. Tess is Seraphina's younger half-sister who has inherited the role of the "bad one." She's not as smart as her sister Seraphina or as gentle and good as her twin Jeanne. Raised by a mother who is a religious fanatic, Tess has never been able to do anything right. She is impulsive and imaginative in a society that doesn't reward that sort of behavior. Her last two years have been spent at court trying to find someone to marry her sister Jeanne. Her impulsiveness has caused her to disgrace herself and she uses alcohol to bury all the memories and pain. It looks like her only life choices will be to act as her sister's support and help raise her children or head off to a convent for the rest of her life. Neither of those choices appeal. So she decides to run away. She meets up with her friend Pathka who is a Quigutl on a quest of his own. Since Tess's main goal has been to get away from her home and even herself, she joins him in the search for one of the seven world serpents who live deep in the earth. Most consider them to be imaginary and the many stories about them just fiction. While on the hunt, Tess gets a chance to meet a number of people and work in a variety of places. She comes to see the Road as a goal in and of itself. She has experiences that help her come to terms with her memories and to find her purpose in life. The language is lush and descriptive. The journey is fascinating. Tess's relationship with Pathka is an unusual one because few people ever bother to learn to quigutl language or philosophy. I thoroughly enjoyed this fantasy story. It will reward the thoughtful reader. His face lit up as if Jeanne herself had spoken, and not Jeanne's oracle at the other end of the couch. Tess didn't mind. She'd have plunged her hand into her sister's back and moved her mouth like a ventriloquist's dummy's if that would have helped. This one caught my eye. I'm glad to hear it was good. Thanks for sharing your thoughts.